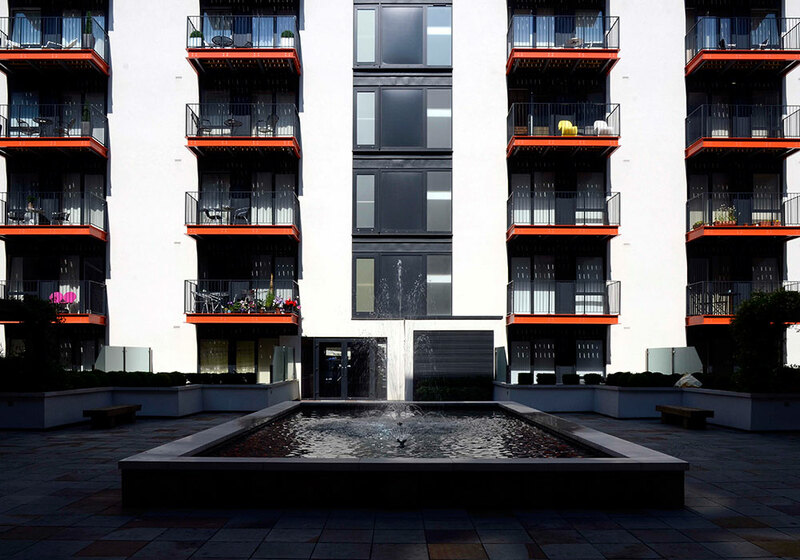 A large scale regeneration programme that spanned 15 years and comprised hundreds of balconies of varying designs and sizes fitted with balustrades of varied styles, including vertical bar, feature panels, brick slips, structural glass and solid infill. Balguard also manufactured and installed balustrades and wall rails to staircases, vehicle and pedestrian gates, wrought iron feature gates, privacy screens terrace railing, car park barriers and steel staircases. Since 2010 we have been the successful bidder for five packages with values between £900k and £3.75m. Working adjacent to Crossrail with craneage installing balconies. 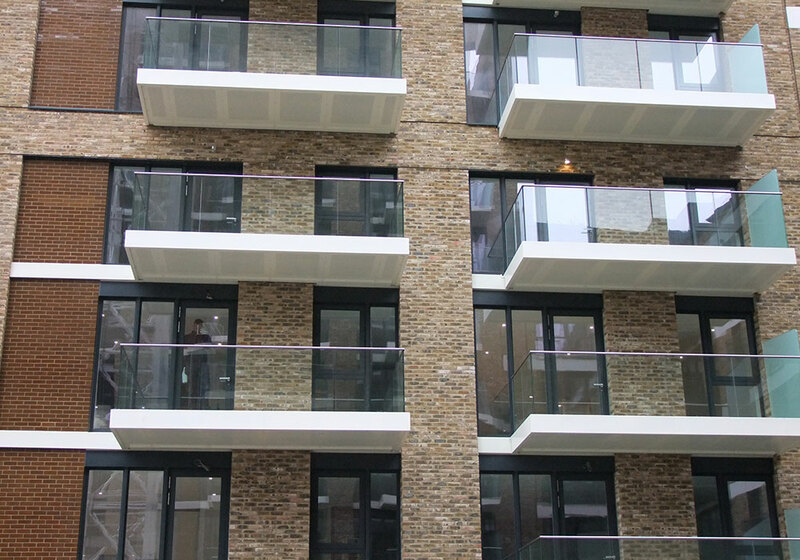 One contract required balconies to replicate the building façade brickwork, this involved matching and incorporating the brick slips into the balustrade system. This was a first for us, however with research and development we provided a very robust system that has stood the test of time, looking as fresh now as the day they were installed. 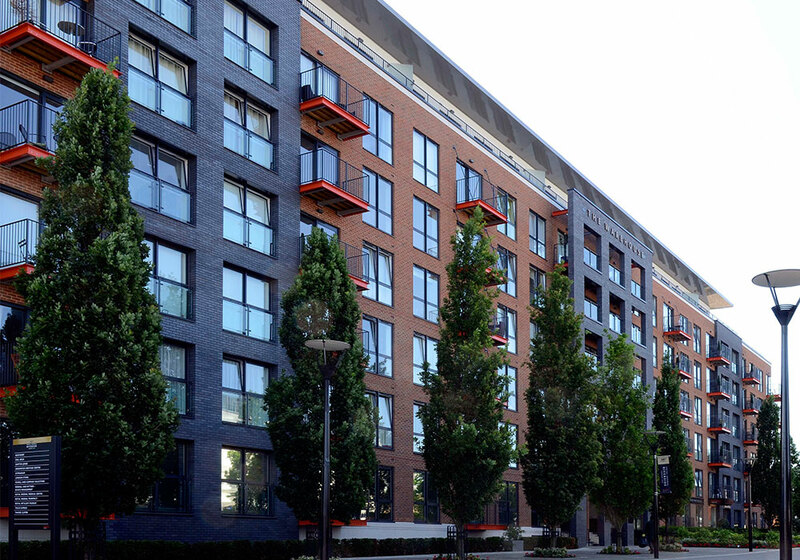 The brick joints in the balconies matched the building perfectly. 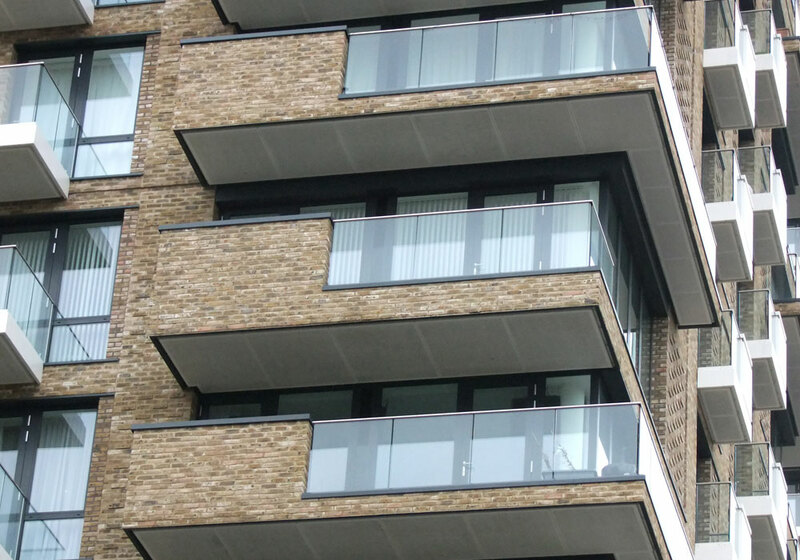 Another contract involved an intricate balustrade system for the balconies and adjacent terraces. The specified polyester powder coating finish for the balustrades required two different colours. Working closely with our powder coaters we ensured the masking was applied quickly and consistently to give a crisp and faultless finish to the satisfaction of the client. During the installation process the programme could not be achieved using the conventional construction methodology. A different method of work was developed to reduce the installation period and manufacturing programme. 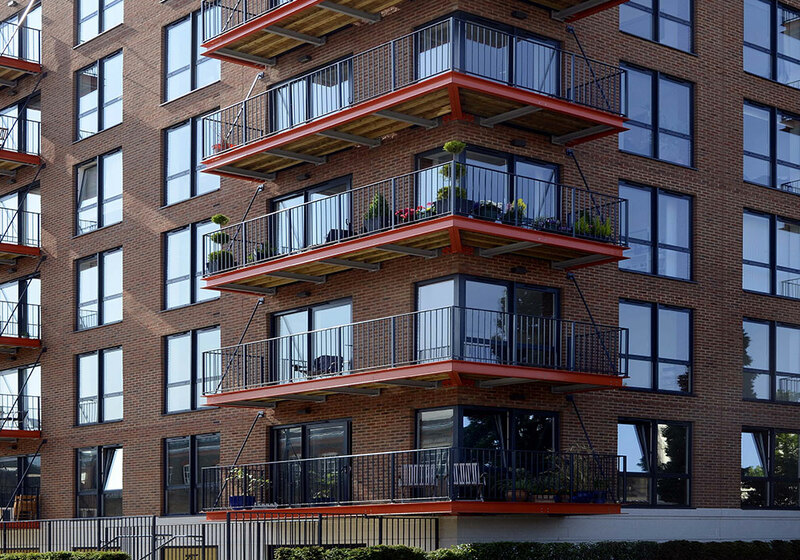 The installation of the balconies followed immediately after the scaffold strike in an “unwrapping” sequence of work, whereby the balconies were erected top down rotational in plan. 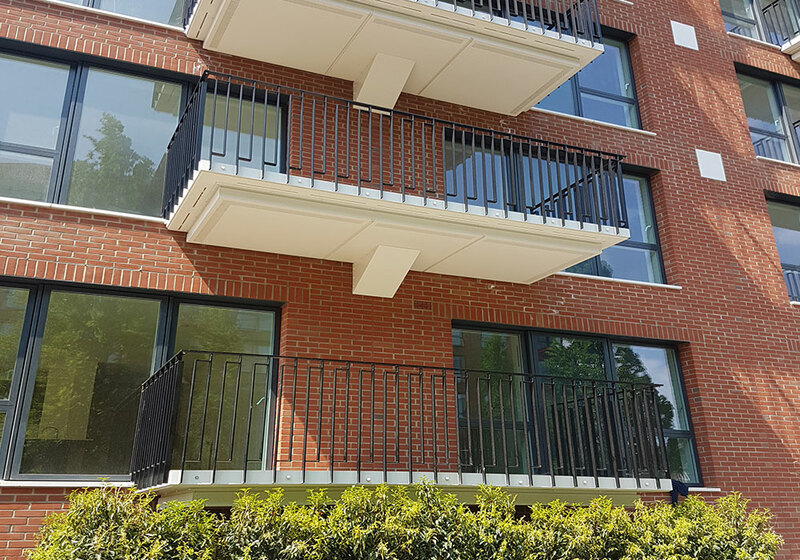 This was achieved maintaining a safe system of work using a bespoke counterbalanced lifting frame which remained horizontal with the balcony load and without the balcony attached. The project was completed on time, while still allowing the other trade to use the crane to meet their programme, and with close attention to safety being our key objective. We are very proud of the finished result and received much praise from our client. Established in 1977, Balguard Engineering is still run by its founding directors. Our focus on quality, service and reliability has enabled us to become one of the UK’s leading architectural metalworking companies. From our 45,000 square foot manufacturing centre, just north of London, we design, fabricate and install a wide range of architectural metalwork such as balconies, balustrades, railings and staircases. We are recognised as experts in our industry, combining extensive experience with the latest technology to fabricate products of exceptional quality at a competitive price. We have a team of skilled tradesmen and engineers who provide a complete solution from design through to installation.